For the second time in just over two months, a U.S. Navy destroyer collided with a merchant ship in the Pacific region, resulting in casualties. 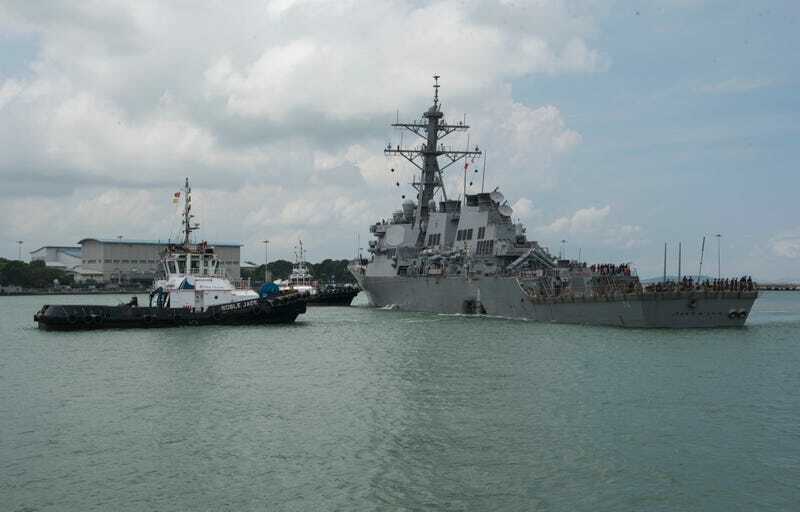 The USS John S. McCain and the tanker Alnic MC collided in the early morning hours of August 21 east of the Strait of Malacca and not far from Singapore. How did this happen? More importantly, how does it keep happening? Here’s what we can assess so far. Aircraft from the nearby amphibious assault ship USS America, as well as ships and aircraft from both Singapore and Malaysia, have aided in the search for the missing sailors. Today, Navy officials announced that “some remains” were found in sealed compartments within the ship during a search. Additionally, the Malaysian Navy said it has identified more remains. This is the fourth incident involving a U.S. Navy ship this year in the Pacific region. On January 31, the guided missile cruiser USS Antietam ran aground in Tokyo Bay near its homeport of Yokosuka, Japan. Then on May 9, the USS Lake Champlain collided with a South Korean fishing boat off the Korean peninsula as the San Diego-based cruiser was on an extended deployment. Then on June 16 USS Fitzgerald hit a freighter that killed seven sailors. The USS John S. McCain was the fifth Arleigh Burke-class destroyer built, and was commissioned in 1994. The ship is not named after the current senator from Arizona, but for his father and grandfather, both of whom were admirals in the U.S. Navy. The destroyer, DDG 56, is one of the Navy’s ballistic missile defense (BMD) equipped ships, carrying the basic Aegis BMD 3.6.1 system. Both McCain and Fitzgerald are forward based in Yokosuka, Japan as part of the Seventh Fleet. Both destroyers belong to the same squadron, DESRON 15, or Destroyer Squadron 15. DESRON 15 is commanded by Capt. Jeffrey A Bennett II; this is notable because his squadron of eight destroyers has been reduced by 25 percent in the last 70 days by two collisions at sea. The Navy has already fired the commanding officer, executive officer and top enlisted sailor of the Fitzgerald with more personnel detriments pending as the official report on the accident is still being prepared. Because of this rash of at-sea incidents, Chief of Naval Operations Admiral John Richardson has ordered a fleet-wide operational pause. This move is quite unprecedented when it comes to the Navy’s surface fleet, though operational pauses, aka safety stand downs, are more frequent in the military’s aviation communities. The pause will allow fleet commanders to review safety training, hopefully providing answers to the what is becoming an all-too-familiar occurrence. With all of the incidents thus far taking place in the Pacific region, Richardson has also ordered a more thorough evaluation of how the Navy prepares its ships to operate in the Pacific. The Straits of Malacca, where the collision occurred, is one of the world’s busiest waterways and a true maritime chokepoint. The strait connects the Indian and Pacific Oceans and nearly 100,000 ships pass through the strait annually. One-quarter of all the world’s goods move through the Strait of Malacca, which is only one-and-a-half nautical miles wide at its narrowest point. The waters where the destroyer and tanker hit are claimed by both Malaysia and Singapore. Both nations have claimed the collision occurred in their waters and that each nation was leading the search and rescue effort to locate the missing sailors. Malaysia went as far to announce that one of its ships, the KD Handalan, was the first unit of any nation to respond to the destroyer’s request for help. One significant difference between this and the Fitzgerald collision earlier this summer is that in the case of the McCain, damage was to the aft port (left) side while Fitzgerald had damage to the starboard (right) side. As I pointed out in an earlier article on the Fitzgerald for Foxtrot Alpha, maritime rules maintain that ships at sea are to give way to other ships to their starboard side. In this case, images of the Alnic MC show some damage to its starboard bow. While it is still very early in the investigation, it would appear that the McCain was on the starboard side of the tanker and had the right of way. The vessel with the right of way, according to maritime rules, is to maintain course and speed, placing most of the burden to avoid a collision on the other ship. The ship without the right of way is to adjust course and speed as necessary to avoid coming together. By keeping one ship on a steady course and speed, the policy is designed to prevent both ships from making simultaneous corrections which would only serve to make the encounter more dangerous. If McCain did have the right of way as described above, the destroyer most likely did not attempt to maneuver until it was too late. However, rules of sea notwithstanding, a $1.6 billion warship does have advanced radars and should have a well-trained crew that is aggressively tacking and plotting all traffic, especially in an area such as the waters near the Strait of Malacca. Each contact would have a CPA, or closest point of approach, plotted providing the officer of the deck the information needed. This ship should have been able to avoid this situation and recognize the dangers of the tanker. Especially in the shadow of the Fitzgerald, the pucker factor should have been high with an overabundance of attention being paid to close surface contacts. Drastic maneuvers may not have been possible in the busy shipping lanes, but a simple increase in speed could have moved the destroyer away from the closing tanker. The speed difference between the destroyer and the tanker is similar to a horse-drawn buggy and a Ferrari—it’s not insignificant here. Ship navigation is the essential element of the Navy’s surface fleet. Without the skill, these ships cannot get to their destination and surely can’t fight. Yet, there seems to be a real problem rearing itself, especially within the Seventh Fleet and more specifically within DESRON 15. Complacency can kill and at the very least will lead to mistakes. It is hard to understand how another destroyer from the same squadron has been involved in yet another collision at sea. Following the Fitzgerald tragedy it is hard to imagine the other commanders of the Japan-based destroyers were not read the riot act regarding the importance of safety of ship as far as navigation is concerned. While the official report is not yet available publicly, it is guaranteed that the Navy knows exactly what happened and whose fault it is. Why else would the Fitzgerald need new leadership? I have said before that the sailor on watch deserves better. That is true, and so does the sailor asleep in their rack. A higher standard must be applied. Being at sea can be very unforgiving and due diligence must be granted to all endeavors. The surface fleet is already struggling with not enough ships to meet demand and combined with longer maintenance periods keeping ships in port longer than expected has put an incredible strain on the active fleet, and losing two destroyers in less than three months does not help ship availability numbers. These accidents will place a higher workload on the other ships in the Navy who must either deploy early or extend deployments to meet operational needs. Most importantly, the Navy has lost sailors to unnecessary accidents. Seven were lost on Fitzgerald. Let’s us hope for the best for those missing from USS John S. McCain.